Visual Studio Geeks | Technical Debt - Why care? How to set up SonarQube to work with TFS using Build Task? Technical Debt - Why care? How to set up SonarQube to work with TFS using Build Task? Why, How, Does it, Can I? 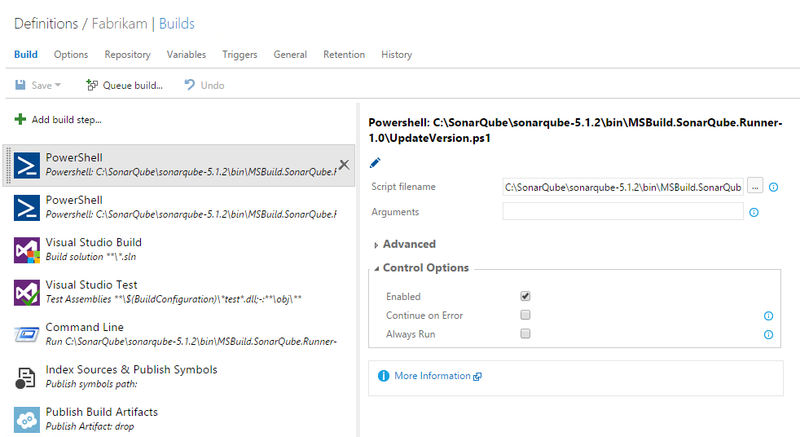 Integrate SonarQube with TFS 2015…? Why should you track TechnicalDebt? There is no right answer here… A high performing team may not need to track technical debt, developer would just fix issues as they find ‘em. Other teams may find it useful to log issues as and when they find ‘em. What ever side of the fence you stand, please spend less time trying to manage technical debt and more time trying to fix it. To avoid the ‘treading water’ situations… I’ve seen scrum teams have goals to keep the technical debt under ‘x’. Scrum teams will drop what they are doing and start paying off technical debt to bring it under x. It may not be worth while paying off all of x, because believe it or not, the last 10 items in x could be very low value. How do I track technical debt? I am expecting the web traffic to the page to drop off by this point… Thank you if you are still reading… SonarQube is an open source platform that is the de facto solution for understanding and managing technical debt. There are other tools available in the market, but for the purposes of this post, we’ll stick to SonarQube. Does SonarQube have a C# plugin? In addition, SonarSource (the company behind SonarQube) have produced a set of .Net rules, written using the new Roslyn-based code analysis framework, and published them in two forms: a nuget package and a VSIX. This makes it possible to run the same set of rules in SonarQube AND directly in Visual Studio. How can I integrate SonarQube with TFS 2015? Case sensitivity! You will run into the below exception if you don’t specify the database name in the same case as it exists in the database. For example, if you specify ‘Sonar’ in the connection string the actual database name is ‘sonar’ you’ll get the following exception. Use the same case! ActiveRecord::JDBCError: The database name component of the object qualifier must be the name of the current database. You may need to update the environment variables on the machine to the java.exe if you run into this problem. Solution here should help. ERROR: JAVA_HOME not found in your environment, and no Java executable present in the PATH. Please set the JAVA_HOME variable in your environment to match the location of your Java installation, or add “java.exe” to the PATH. Once the analysis has been completed, I can see the results in the sonarQube portal. At the risk of upsetting those of you who came looking here for a silver bullet to magically detect and destroy Technical Debt, you’re going to be disappointed. It took work, inattention to detail, possibly poor craftsmanship, to build up the Technical Debt… It will take work, paying attention, and having professional craftsmen to pay off the Technical Debt. Good Luck! Tarun Arora is obsessed with high-quality working software, DevOps, Continuous Delivery and Agile. His core strengths are Azure, Azure DevOps, PowerShell, SQL and WPF. He is a Microsoft MVP in Visual Studio Development Tools and the author of 'DevOps & ALM with TFS 2015'.